SCR is one of the most important member of semiconductor family, quickly replacing other Power Electronics devices. The construction of SCR is very simple. The first SCR was developed in Bell Laboratories by General Electrical Company of USA in 1956. Silicon is the main material used for the construction of SCR. SCR is a four layer semiconductor device which is unidirectional in nature. Unidirectional refer to its property to conduct in one direction only. It means an SCR will allow current to flow when it is forward biased and no current will flow through it when SCR is reverse biased. An SCR has three terminals viz. 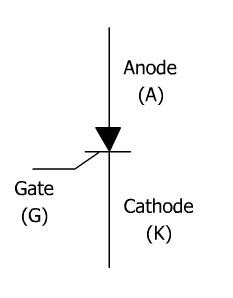 Anode(denoted by A), Cathode (denoted by K) and Gate (denoted by G). As I told SCR consists of silicon junctions and there are total four layers and three junctions in an SCR.For convenience these junctions may be named as J1, J2 and J3 as shown in SCR construction below. It is very similar to diode except the gate terminal as shown. SRC works can be connected to supply in two ways i.e. 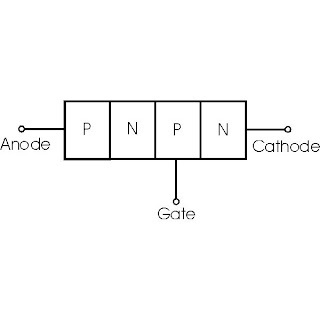 Cathode to positive and Anode to negative and vice verse. When Anode (P-layer) is connected to negative SCR will become reverse biased and no current will flows through it. This is due to the fact that upper and lower most junctions J1 and J3 are reverse biased in such arrangement and only J2 is forward biased so the only current flow will be due to the reverse leakage current. When Anode is connected to positive terminal of the battery and Cathode to the negative terminal of the supply, the junctions J1 and J3 will become forward biased and only junction J2 will remain reverse biased. As the voltage is increases breakdown of junction J2 occurs and SCR starts conducting.